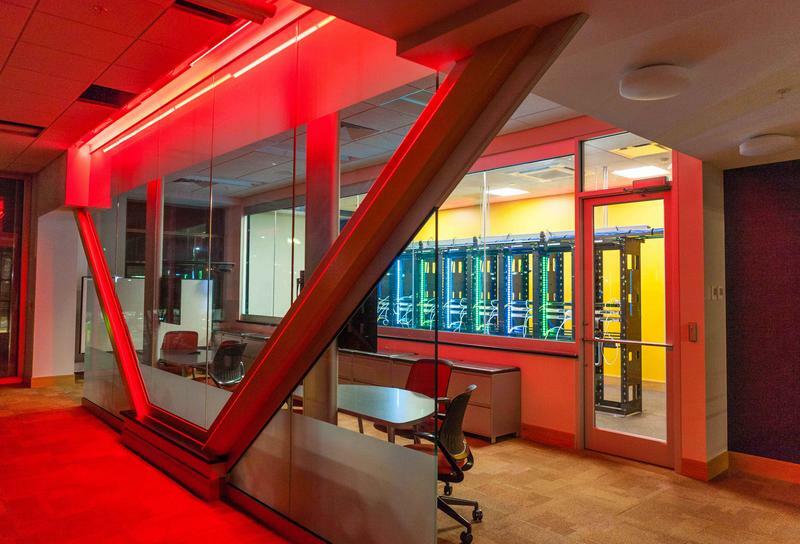 With dual monitors, huddle stations and a glassed-in server room, NKU's JRG Cyber Threat Intelligence Laboratory is designed to train a future workforce to identify and stop cyber threats. The cyber security lab is the first major upgrade in Griffin Hall since it opened in 2011. "We're bursting at the seams," says Kevin Kirby, dean of the school's College of Informatics. "Cyber security is in high demand, and we wanted a realistic threat center environment for our students to learn in." In it, you'll find a glassed-in server room, huddle stations, and 24 computer stations with dual monitors. Kirby says it fills a need, as there's a shortage of cyber security workers. "I think the threat landscape will get more dangerous as we move into a world where there are smart devices everywhere." That's the message from the nation's top security chief. Director of National Intelligence Dan Coates told Congress in February the U.S. is "under attack," and that he expects continued cyber threats from Russia, China, North Korea, and Iran. An estimated 300,000 new viruses are created every day. Allyson Frame and Dean Kevin Kirby look at the lab's server room. Information Technology major Allyson Frame hopes to eventually stop some of those threats. She's a member of NKU's award-winning Cyber Defense Team. It will compete in the Midwest Regionals March 22-23 in Chicago. There's a reason she's interested in cyber security. "It's kind of hard, that's what I like about it. It's always changing. It's always adapting. You have to be constantly learning and trying to adapt to threats in the real world." Eventually, Kirby plans to take middle and grade school kids on a tour of the lab. It will also be used for cyber security summer camps. For more on this story, tune in to WVXU's "Focus on Technology," airing Mondays at 6:44 a.m. and 8:44 a.m. during "Morning Edition" and again at 4:44 p.m. during "All Things Considered."